CEFCO is co-organized by China Council for the Promotion of International Trade (CCPIT) jointly with Global Association of the Exhibition Industry (UFI), International Association of Exhibitions and Events (IAEE) and Society of Independent Show Organizers (SISO), and coordinated by China Chamber of International Commerce (CCIC) and Macao Trade and Investment Promotion Institute (IPIM). Several meetings and activities were held today (Jan. 13), the second day of the CECFO 2017. Tomorrow (Jan. 14) the Co-organizers and Coordinators will arrange visits to Macao´s convention and exhibition facilities, etc., for the participants to experience for themselves Macao´s culture and tourism characteristics. Mr. Wang Jinzhen said that, so far, 13 editions of CEFCO have been held, with the main purpose to boost the stable development of the MICE industry at home and abroad. CEFCO is rotatively held in different cities and this year the host city is Macao. 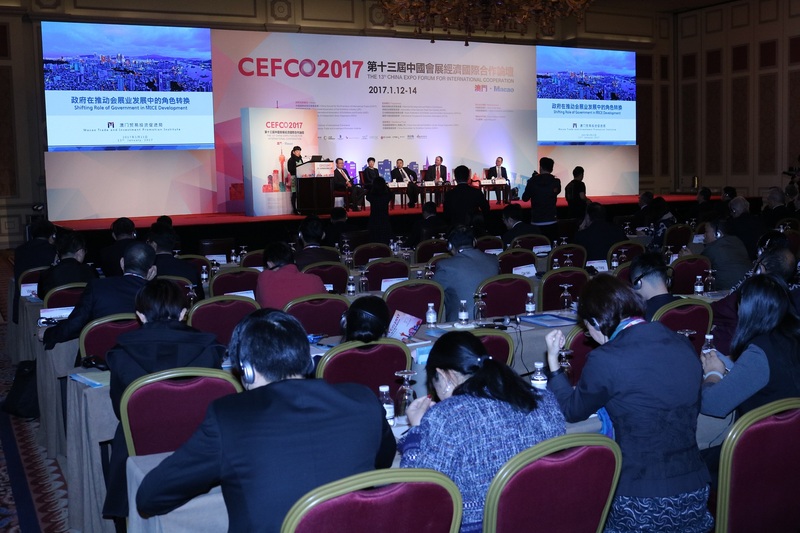 Thanks to the concerted efforts of the Mainland China and Macao SAR Governments, this edition of CEFCO has attracted over 800 participants from 25 countries, including participants from Portuguese-speaking Countries. This fully demonstrates that the Macao SAR Government and other relevant agencies and organizations have made tremendous efforts in the organization of this event. Also, the content as well as the arrangements of the sessions have their own characteristics. The overall content goes around the macro and micro combination in the development of the MICE industry, with rich content especially highlighted; with the “Macao MICE Business Zone” set up at the venue, participants could better understand the services offered by the Macao MICE industry. He said that Macao is an important fulcrum of the “One Belt, One Road” initiative. It is backed by Mainland China and has close ties with the Pearl River Delta and Yangtze River Delta, while maintaining close contacts with countries and regions abroad, especially the Portuguese-speaking Countries. 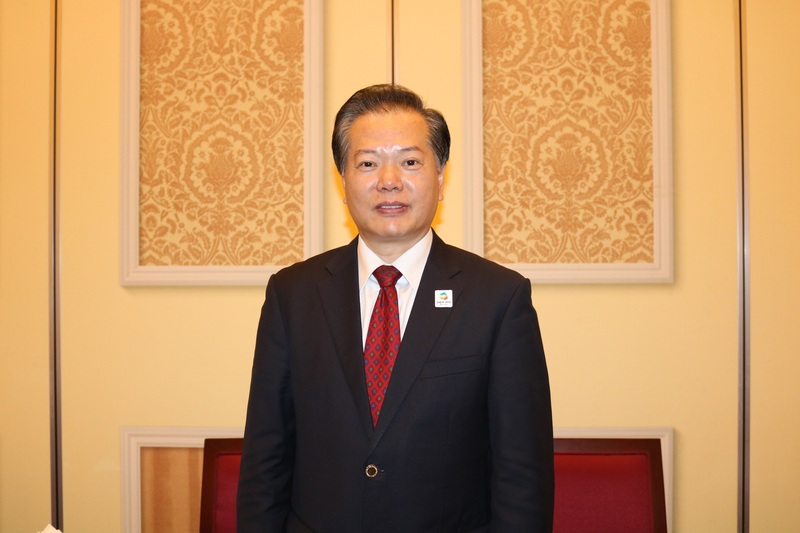 In addition, the Macao SAR strongly supports the development of the MICE industry, through the promulgation of favourable and supportive policies, and has especially included the development of the convention and exhibition industry in the Macao SAR´s 5-Year Development Plan (2016-2020). 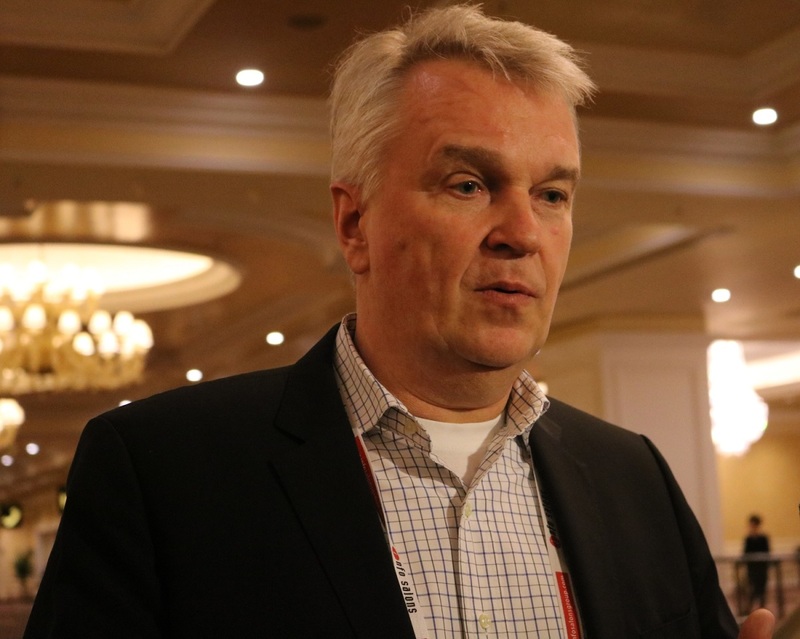 Looking ahead, he suggested that Macao could move towards high-end MICE industry, especially starting from high-end conventions, and then pushing forward the high-end exhibitions. He believes that this will play a positive role in the sustainable development of Macao´s economy. Macao, as the host city of this edition of CEFCO, has developed its advantages as a Services Platform for Trade Cooperation between China and Portuguese-speaking Countries, especially inviting delegates from the PSCs to participate in the event. According to Mr. Wang Jinzhen, owing to the fact that most of the Portuguese-speaking Countries are either emerging or developing countries, opportunities abound. Therefore, by stressing on inviting delegates from the PSCs to participate in CEFCO, it is possible for them to get a better understanding of the convention and exhibition´s role in the economy, and also, in-depth discussions could be conducted so as to invite more Chinese organizers of events to hold MICE-related activities in their countries. Furthermore, he said that, last year, Chinese organizers held over 600 fairs in 36 countries along the “One Road, One Belt” route and it is expected that the number will be increased this year. As several PSCs are located along the “One Belt, One Road” route, CEFCO and Macao´s platforms could be used to lay a good foundation for co-operation between countries along the said route. 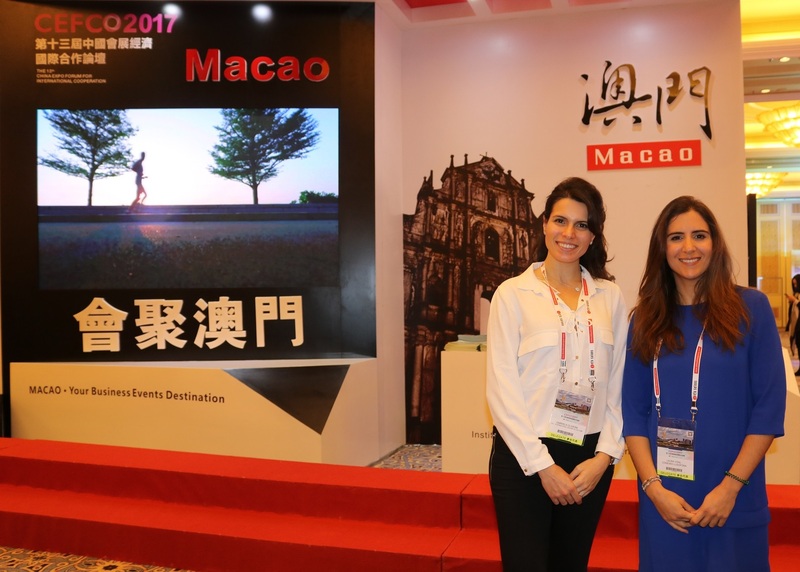 On the other hand, Laura Vidal from Lisbon, as a PSCs delegate, said that this is her first visit to Macao and also her first participation in CEFCO. She said that, as far as she is concerned, this first visit to Macao is both familiar and special. It is familiar as Macao retains the Portuguese-style architecture and Portuguese as one of the official languages here. It is special because Macao is located next to Mainland China, while maintains close ties with the PSCs, playing the role of an important communication bridge between China and the PSCs. She said that through participating in CEFCO, she did not only establish contact through the convergence of businessmen from China and even all over the world, but also had the opportunity to know Macao´s new development. She also expressed the intention to enter the Mainland Chinese market through the Macao platform. Ms. Gabriela Faria de Oliveira, Executive Director of CIC – Centro Internacional de Cultura, a centre engaged in cultural exchange activities in the PSCs, said this is her first participation in CEFCO and that the event, which also involves MICE-related industries, will be beneficial for exchange and co-operation. After this first participation, she considers that Macao´s MICE hardware and software facilities are perfect and therefore she proposed that efforts should be made to strive for the holding of “Web Summit” in Macao. At today´s “Global MICE CEO Roundtable”, one of the participants, Dr. Gerd Weber, senior expert of Jochen Witt Consulting (JWC), from Germany, is pleased with the results of this participation and endorses the professionalism of the event. He said that Macao´s investment environment has advantages and also offers certain entertainment facilities. Therefore, traveling to Macao to attend CEFCO also gave him the opportunity to inspect the city´s investment environment and tourism.